Today, we did a simulation on building a civilization using our resources. The plan was to develop a language, a temple for a god/goddess, laws, and a unique secret invention, ahead of the other civilizations, like a race between cultures. My part in the group was to design a temple for the goddess. I had to design and draw a floor layout plan and a 3-D drawing of the finished temple. 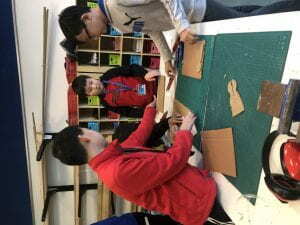 Our group divided the work based on our skills and interests. For example, I was good at drawing, so I designed and drew the temple, meanwhile, Andy was interested in laws. 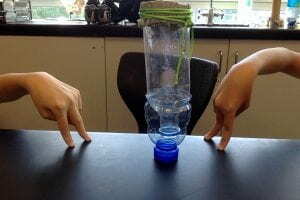 Finally, Julia and Sophie created the language and traded for the materials to build the secret invention. Our biggest accomplishment was having all the materials needed to build our invention by trading. We didn’t have any penalties or broke any rules. Our weakest point as a civilization was figuring out how to build the invention. If we could redo this simulation, I would work faster and focus less on details so we could finish faster and more quickly so we could develop faster as a civilization. One Day Life Size Chess! 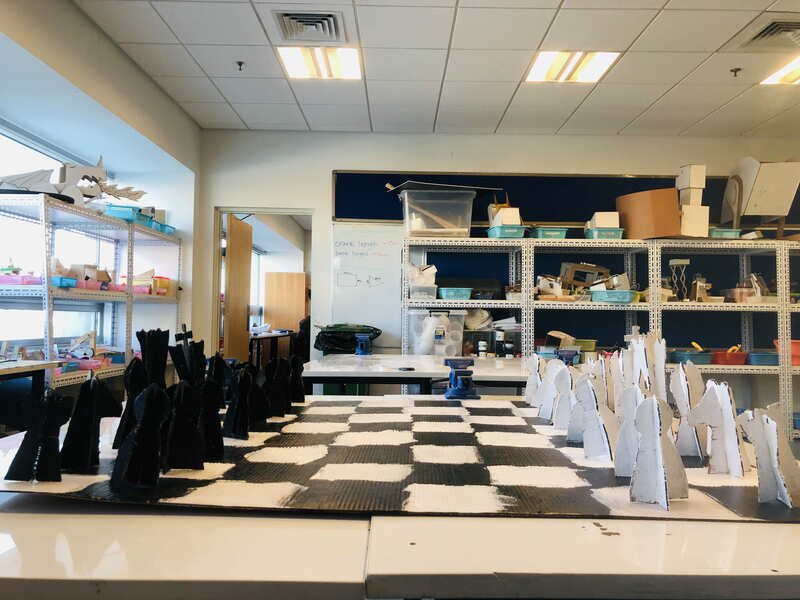 January 31, 2019 / Dylan / Comments Off on One Day Life Size Chess! Today is OneDay! Me and my partners, Ryan, Jayden, Minh, and Jon, made a giant chess board and pieces! We had lots of fun designing, tracing, cutting, assembling, and painting. We decided to make the pieces by interlocking two cardboard cutouts so they could stand. I think we did well at working together to complete a big goal. One thing I learned is that sometimes you have to give up your own idea for someone else’s. My personal favorite is when we cut it because it was great when we finally popped out and saw the end result. 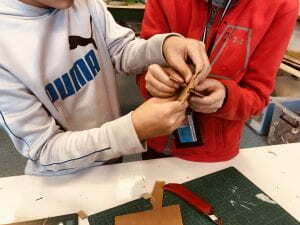 One challenge we faced was that sometimes the cardboard was too flimsy and broke when trying to assemble them. We overcame it by fixing it with strong tape and hot glue. OneDay is important because it allows students to pursue and experience their choice of project. Below are some images for our chess board. January 30, 2019 / Dylan / Comments Off on Ancient China Video! Here is the final video that I and my group made for ancient China and calligraphy! January 11, 2019 / Dylan / Comments Off on The River Population Debate! Today our class had a debate for whether it is better to live near or far from a river in early human times. My claim is that it is more beneficial and helpful to live near the river. One reason is that water has many different uses and useful properties, for example, We can use water to drink, navigate, fish, wash, cool down, cook, travel, grow better crops, and have more prey, all just by living nearer to the river. With this many benefits, it outnumbers the amount of unbeneficial properties such as floods, diseases, and the threat level of enemies and wild animals. Another reason is that being near a river can provide many extra survival skills to use than being farther away from the river. For example, you can learn the ability to fish or learn tricks to survive an animal encounter or a flood. This is why I think that it is better to live near the river than farther away. This is my ThingLink I made for my Social Studies Project, about Early Humans and Modern Humans food. You roll the arrow over the image to see dots, and hover over the dots to get info. I and my partner Samuel designed this cup insulator to keep out the cold winter air of Beijing for teachers drinking coffee! Our design is easy to remove and put on with three straps that are also durable to keep the insulator on the cup. If we had more time to improvise and make a new prototype, I would have gotten rid of the extra big strap and instead had a smaller less lumpy one. One new skill I learned was that you have to use the end of the scissors (the one near the handle) to cut through extra thick or squishy materials. 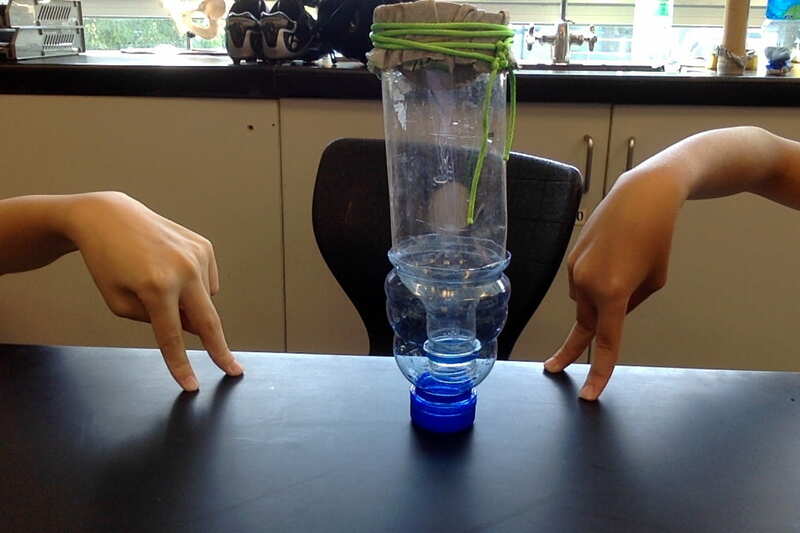 Both I and Samuel thought that this insulator was a success! November 9, 2018 / Dylan / Comments Off on My Awesome Cranky Contraption! 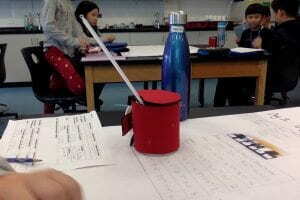 In Design class, I made an awesome cranky contraption! Credits to Thinglink for making this amazing interactive image! Here is my I Am From poem. I made it for a humanites project. I used StoryBird to make the pictures and use iMovie to make it all fancy. August 31, 2018 / Dylan / Comments Off on Stranded Island Filter! Me and Aidan created a filter for dirty water! Materials: Plastic bottles, a shoelace, and a cloth. This filter works by having the dirty water go through the sand and cloth (at the top of the build) so that the water goes through the sand and cloth and leaves the dirty stuff behind. Then it goes through the bottle into the cup at the bottom. Then you remove the cup to drink water!